Even if only one tooth is missing, consider getting dental implants right now! Tooth loss affects quality of life. If you are missing teeth, have failing teeth or wear dentures currently, you know how true this can be. Tooth loss can affect the way you eat, how you speak and even smile. For example, friends have invited you over for dinner, and they’re serving fresh corn on the cob. You want to bust an all-out smile and hearty laugh while visiting after a great meal, but you refrain. The problems you encounter because of tooth loss won’t go away unless you make a permanent change. Consider dental implants as an option. Statistics tell us that almost 7 in 10 adults between the ages of 34 and 44 have lost at least one permanent tooth because of an injury, disease or some other cause. Losing a single tooth may not seem like a big deal, but it can set off an unpleasant domino effect of oral decline. Even if you’ve lost only one single tooth, consider dental implants as an option for tooth replacement. What Can Happen When Even One Tooth Goes Missing? The first thing that can happen when even one tooth goes missing is migration, or unwanted movement, of the adjacent teeth. When there’s a gap in the tooth lineup, teeth near the gap begin to tilt forward and drift toward the front of the mouth. This may cause bite problems. In addition to looking unsightly, migration can create difficulty in maintaining good oral hygiene. And poor oral hygiene leads to gum disease and tooth decay. Next, the tooth opposite to the missing tooth, may begin to push further out (supra-erupt) from the gums. This happens because the missing tooth’s ‘partner’ on the opposing jaw, now has nothing pressing against it when the mouth is closed. This can cause more bite problems and exposure of the ‘partner’ tooth’s roots. When roots are exposed, a tooth is more susceptible to decay, especially if the gums are not healthy. Once tooth loss begins, more of the same problems will continue to happen if it not treated properly and quickly. As nearby teeth are weakened by disease or bite problems, they will begin to fail as well. Very soon, the body begins naturally resorbing (eroding away) the bone under missing teeth. Bone loss destabilizes the jaw structure and may lead to a prematurely aged look. Eventually, the entire mouth is affected. All because one tooth went missing. What Can Be Done About Missing Teeth And The Problems That Follow? Bridges or dentures are a possible solution for missing teeth and all of the problems associated with tooth loss. If you’re considering bridges or dentures though, you may want to rethink that consideration. Bridges rely on the support of healthy teeth near the gap caused by a missing tooth. Those healthy teeth must be ground down or “shaped” to accommodate bridges. This grinding or “shaping” makes those healthy teeth more susceptible to decay and may require a root canal in the future. Bridges are expected to last up to 5-10 years before needing to be replaced. Dentures are a relatively inexpensive replacement option. However, they are often a source of frustration and embarrassment. Worse yet, they don’t stop the process of bone loss (resorbing). Instead, they accelerate it. Obviously, if you could turn back the clock, you would take care of even one missing tooth before needing bridges or dentures. If you are missing one or more teeth, consider dental implants right now, before the need for bridges or dentures surprises you. What can be done about tooth loss and the unpleasant domino effect caused by tooth loss? The best solution is dental implants. Dental implants are an effective, permanent solution to stop the progression of problems caused by tooth loss. Dental implants are set directly into the jawbone. They actually fuse with the jawbone in a process called osseointegration. This process prevents further bone loss and stabilizes the bite. Dental implants aren’t susceptible to decay. With proper care, they can last a lifetime. Plus, they look and feel very similar to your natural teeth! One tooth or multiple teeth can be replaced with dental implants. However, the longer you wait, the more complicated and costly the dental implants procedure may be. The longer you wait, the longer you’ll be living with dental problems that won’t be getting better. Want to save some of that time and cost? Come see us about dental implants sooner, not later. Save that smile! Even if only one tooth is missing, call (780) 464-4166 right now. 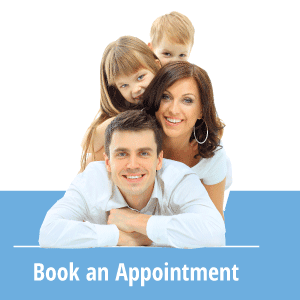 Schedule a consultation with us here at Sherwood Dental about dental implants.